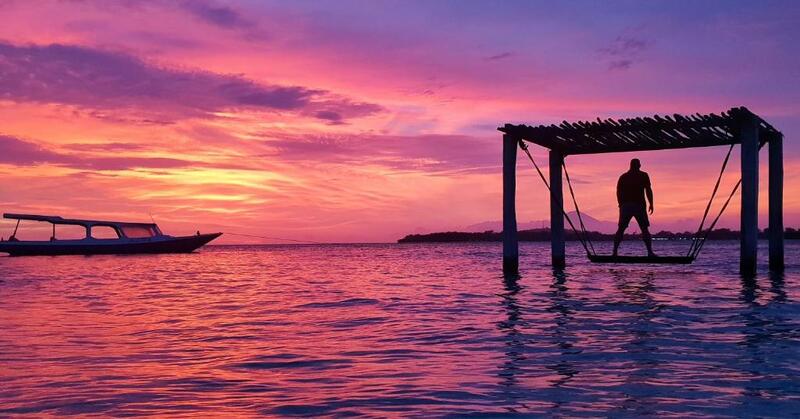 Lock in a great price for Grand Sunset Gili Air – rated 8 by recent guests! The breakfast was just fine, although service is really god. As a suggestion the hotel could help the guests arranging transport from harbour to hotel because is not nice for guests to deal with the locals that handle the transport because they want to take always advantage of you. The hotel is situated in front of the sea, perfect for sunset watching. 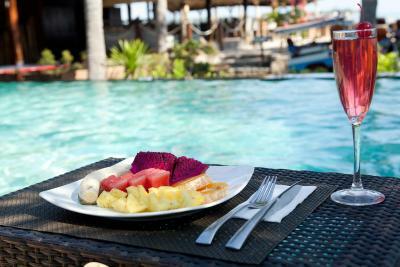 The pool is quiet big and the hotel’s restaurant has a tasty choice of food and drinks. The hotel’s team is kind and helpful even if a bit more on the laid back side (sometimes you ask yourself if they are clients or employees). We really enjoyed the quiet and relaxing atmosphere at Grand sunset. It was on the quiet side of Gili Air and we liked the privacy this afforded us. The staff were all friendly and helpful. The service was great and the sunset views were amazing. Great and friendly staff. Good breakfast. Decent rooms (and we got a new room when asked for it). Excellent breakfast! Helpful stuff, we got discount because they had reconstruction at the hotel without saying it before. Good place for sunset! The included breakfast far exceeded expectations. 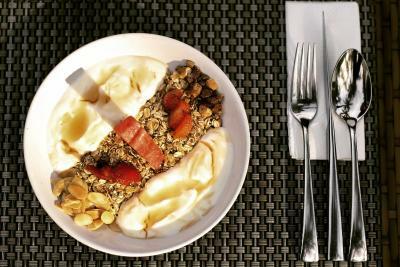 Instead of a buffet, you get to choose a breakfast from a menu, and each option was delicious. Staff were very friendly and helpful They even were mindful of when we were at breakfast and tried their best to clean our room while we were eating so as to not disturb us later if we were in the room. On our last night the hotel had organized live music and a fire show, which was a nice surprise. The location is perfect. Quiet spot direct on the beach. Breakfast is lovely but we have to say the accommodation needs some renovation. It should be a little bit higher level for the price we paid. Doors of cabinets broken, cheap way of making a bathroom. Shower in a place that everything is wet after a shower. The area on the beach was every day little bit a mess. Chairs everywhere and not in line. 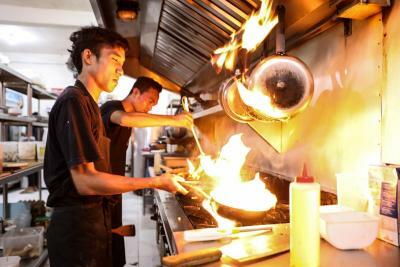 The restaurant is good, good food and a lot of variation. The sea view from the restaurant was very romantic. We liked the setup of the hotel! Very cosy and easy going. Pool was nice, as well as the beach bar. Staff were helpful. Grand Sunset Gili Air This rating is a reflection of how the property compares to the industry standard when it comes to price, facilities and services available. It's based on a self-evaluation by the property. Use this rating to help choose your stay! Located just 20 feet away from the pristine white sandy shores of West Beach in Gili Air Island, Grand Sunset Gili Air offers cozy and homey beachfront accommodations with outdoor pool and free WiFi access in all areas of the property. The property is about a 15-minute walk from the island's harbor. Reaching Gili Air Island from Lombok Praya International Airport will take a 2-hour drive to Bangsal Harbor in Lombok, and another 20-minute boat ride to Gili Air Harbor. 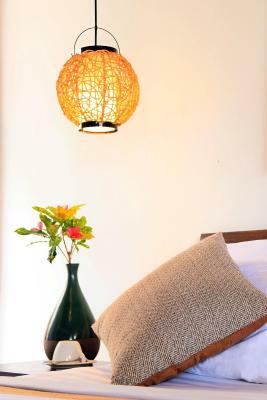 The air-conditioned rooms at Grand Sunset Gili Air are all beautifully appointed with comfortable beds, a wardrobe, seating area with a desk, and a flat-screen cable TV. Each room also comes with an private bathroom featuring shower facility and free toiletries. Fresh towels and linens are provided in the room. Guests can enjoy the amazing sea view from the room. Guests staying at Grand Sunset Gili Air can take advantage on free facilities like luggage storage and safety deposit box. The concierge service can assist with laundry requests, bicycle rentals, and in-room massages all with surcharges. There is also a tour desk where guests can get help to organize their travel arrangements as well as activities like diving, snorkeling, fishing, and cycling. Water sport facility is available at an additional fee. As for dining option, guests can explore the surrounding area where an array of all-day dining restaurants are available just a walking distance away. 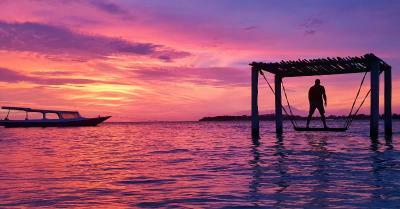 When would you like to stay at Grand Sunset Gili Air? This air-conditioned double room comes with big comfortable bed, wardrobe, seating area, and flat-screen cable TV. The private bathroom feature shower facility and free toiletries. This twin room features a wardrobe and a flat-screen cable TV. The private bathroom has shower facilities and free toiletries. House Rules Grand Sunset Gili Air takes special requests – add in the next step! Grand Sunset Gili Air accepts these cards and reserves the right to temporarily hold an amount prior to arrival. The staff were extra friendly and learnt you name, beautiful pool overlooking the sunset. Basic and tired rooms with no charm and a little grubby but ok.
friendly staff, especially on the bar :) big nice pool amazing outdoor bathroom 😍 the hotel area is very cute and they keep it always clean and lovely nice atmosphere🌴 Comfortable beds 3 options for breakfast, something for everyone but the muesli is sold out very fast or they don’t even had it :/ we stayed a night longer than planned :) gili air is a really nice place ❤️ Thank you for the nice stay, we really enjoyed it ! Everything was excelent & perfect, totally the location for the sunset. Open bathroom like a villa style & there are movies to choose from for the TV in the room. Luckily we got a promotion price, which is really worth to pay. The room smelt of mould and the outside bathroom is impractical in torrential rain - this needs a re-think. Rooms aren't very well soundproofed so you can here things you'd rather not from next door! Location was lovely and the staff were really great. Beautiful island and romantic place. The room and bathroom were perfect - I loved the outdoor en suite. The staff were extremely pleasant. I did a diving lesson with the excellent Gili Air Divers who were on site, so this was a great place to stay. It was a bit far from the harbour, so if you had a suitcase you had to rent a horse carriage for 150-200000 IDR. Beach not the greatest for swimming. Great location for a sunset. Also had a dive shop on site so good for them. Very friendly staff and good service. Outdoor bathrooms were interesting, especially when it was raining hard. Breakfast included. Quieter side of the island if that is what you are looking for. Staff were mostly horrible. Too busy on their phones and inattentive. Came back one day to a room that hadn’t even been cleaned. Manager was excellent, got things done from staff ASAP. Felt sorry for him dealing with his staff. Restaurant was terrible. Beautiful hotel, pool and beach! !